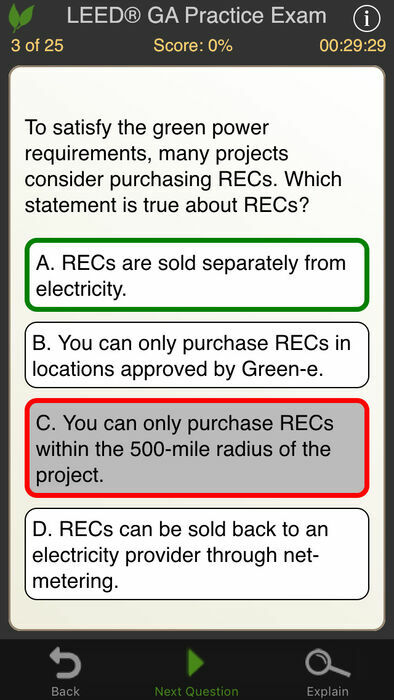 160 multiple choice questions, answers, and detailed explanations to help prepare for and pass the LEED v3 Green Associate exam. John Wiley and Sons, one of the world’s most respected and largest providers of education books and content for the architecture and construction markets, is now offering the “Learning to LEED GA Practice Exam” app to help you prepare for the LEED Green Associate exam. “Learning to LEED” is the highly successful educational program developed by Charles Kibert, PhD, P.E., LEED AP, based on a two day training workshop administered by the University of Florida in which over 90% of the 3,500 students attending the course took and passed the LEED exam. Now you have the backing of Wiley and the expertise of leading LEED exam prep professionals in a single, easy-to-use, content and feature packed app. 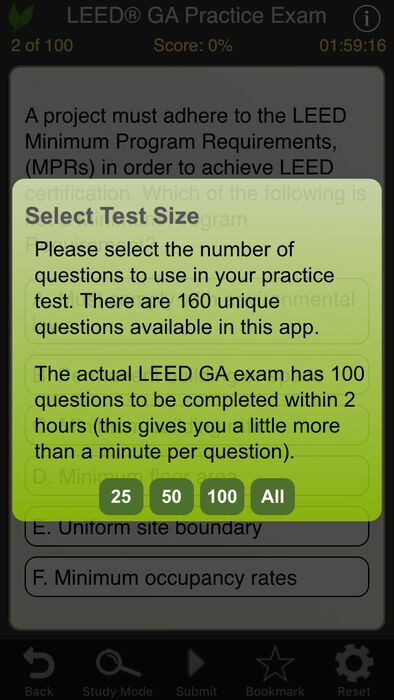 Select the test size that fits your time: You can choose to take a practice exam with 100 questions (the actual number of questions on the LEED GA exam) or all 160 questions. If pressed for time you may custom select exams of 25, 50, or 75 questions. Automatic reshuffling: Each time you reset the exam to ensure that no test will be exactly the same. Study or Exam Modes Available: Study mode gives you instant feedback on questions, including correct answers and explanations. Exam mode allows you to progress through the entire exam and provides scoring and review of answers upon completion. Bookmark feature: Lets you mark a question for further review at a later time. Self Timer: Helps you keep track of your pace—just like the real LEED exam. Content for this application comes from the WileyCPE.com’s “Learning to LEED” online exam prep and continuing education courses. The WileyCPE.com courses are approved by the American Institute of Architects and American Society of Landscape Architects, and enable users to earn the CEU credits to satisfy membership and state licensing board requirements. The WileyCPE “Learning to LEED” online course Green Building Fundamentals for the LEED Green Associate provides students and professionals the necessary background in green building fundamentals and LEED v3 rating systems to be able to take and pass the Green Associates exam given by the Green Building Certification Institute. Upon successful completion of this course, users will receive a Certificate of Completion which meets the GBCI requirements for the education option for demonstrating experience with green building fundamentals, a requirement to become eligible to take the LEED Green Associate exam. Visit WileyCPE.com/learningtoleed and purchase the complete Learning to LEED V3: Green Building Fundamentals for the LEED Green Associate course. Download this app and get a promo code for a 20% discount.